Flavor Text: He would always have at least one way out. Its the best cost event and can make a crucial difference in a turn. Only 1 steadfast so not too hard to put in any deck featuring Agency. OK, its soft control, but at that price what's not to like? Free to play events are a good way to catch your opponent unprepared. Timed right the can leave your opponent unable to defend a story and it even works on ancient ones. If the government is good at one thing it's...collecting taxes. If the government is good at TWO things it's collecting taxes and putting people in jail. At 0 cost this card can find its way into any deck running the boys in blue. My favorite Agency event card, hands down. It's the one of the backbones of my "Bench Warrant" Agency/Yog story denial deck, though it can easily find space in any Agency deck. The fact that it can target Ancient Ones for no cost and only 1 steadfast is incredible. And now the Agency Day parole denial deck is even better with Supernatural Investigator, who makes it easy to bring Behind Bars back for repeated play. 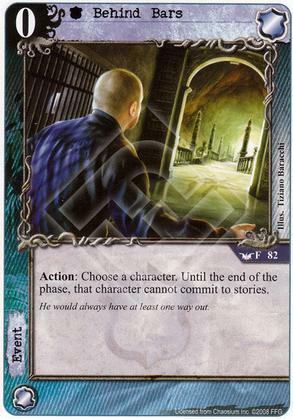 Paired with Silver Twilight (a classic combination), you can also use BRB to continually put your opponent's characters in the slammer. Then hit Brown with Small Price to Pay to reset him and they're looking at an extended lock-up. This card has been unavailable for some time due to Sleep of the Dead being out of print, but it should see more play now that FFG has added the Dreamlands cycle to POD. One of my favorite cards in the game! I also love the artwork - and bought a poster-sized, signed printing of it. Yes, this card is very good. Just like exhaust effects for all intents and purposes, except it can target an AO.